The 2017 Jeep Cherokee is a compact SUV that is anything, but ordinary. It is a true modern family SUV offering a supreme level of comfort and a broad range of impressive modern features. By the look of it, it is a compact SUV that also has a sporty edge to it. The new 2017 Jeep Cherokee is considered one of the top tier compact crossovers SUV that gives solid competition to many luxury crossovers. 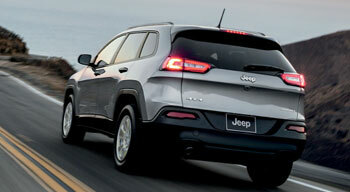 The new Jeep Cherokee is available in five distinct trims including Sport, Latitude, Limited, Overland and Trailhawk. The new feature in the new series is the addition of HID headlights, but they are not available for the Sport trim. What’s more is that the crossover SUV has been made more luxurious with its gorgeous and comfortable ventilated Nappa leather seats. The leather is posh and makes you feel relaxed even when you have been driving all day. This crossover also has some serious off-road abilities that give it the sporty title that it is well known for. It is also a spacious crossover SUV considering it is a compact sized vehicle. There are many custom options available for many trims in the line-up and you can also choose between FWD, AWD, and 4WD. The 2017 Jeep Cherokee is equipped with a 2.4 litre 4-cylinder engine offering 184 horsepower. Apart from its base engine, it also offers a 3.2 litre V6 engine that offers 271 horsepower. For its compact size, this SUV has quite impressive towing power and can easily tow up to 4,500 pounds. Whether you choose to go with a 4 cylinder engine or V6, you get decent fuel economy. In the 2017 Jeep Cherokee, both engines offer a 9 speed automatic transmission with options of either 4WD or FWD. the 4WD with Selec-Terrain system feature, which offers maximum traction based on drivers’ settings for sand, snow, mud, etc. The impressive thing about this feature is that you can put it on auto mode, which means that the system will select the mode for you. When it comes to fuel economy, the 2017 Jeep Cherokee might not be the best in its class, but certainly a good one standing at 21 mpg city and 30 mpg highway for the FWD option with 4-cylinder engine. The off-roading capabilities of the 2017 Jeep Cherokee are pretty clean. 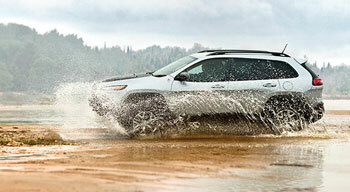 There are multiple traction options in the crossover and drives smoothly over rough terrain. Furthermore, there are two AWD and 4WD drive options including Active Drive I and Active Drive II. When you look at the 2017 Jeep Cherokee, you see a compact, but sporty crossover SUV. It looks stylish, practical, and spacious. The LED headlights have a broken design which gives off a unique effect. The 7-bar grille on this model is pretty thin and hardly noticeable. 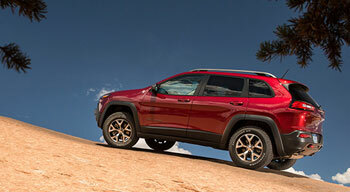 The Trailhawk version of the crossover has a more sporty and powerful appeal than other trims in its line-up. It has a higher ride with skidplates, aggressive front and rear design features, and red painted front tow hooks that give it a distinctive look. The interior of the 2017 Jeep Cherokee is quite impressive and practical. The overall layout gives off a premium look to the SUV. There are power adjustment options for the seats and the second row seats can adjust both forward and backward depending upon the amount of legroom space you want. What’s more is that this model features an array of luxury finishes including its upscale seating made from the soft and high quality Nappa leather that are heated and well ventilated. The dashboard and the front area of the cabin give this crossover an appealing look which resembles to a cockpit. The cabin is equipped with top notch technology including a wireless device charging pad. The interior looks sporty, but is not too rugged, which is why it settled in the family crossover segment perfectly. The interior is sleek and clean with nothing edgy. 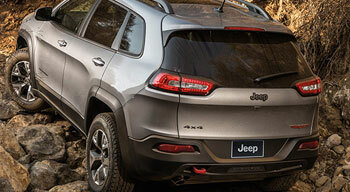 As far as entertainment is considered, the 2017 Jeep Cherokee consists of adequate features including the 8.4 inch Uconnect infotainment system with audio streaming application connectivity. What’s more is that when you go for a higher trim level, you get a full color configurable LED instrument cluster. The standard equipment in the 2017 Jeep Cherokee includes a 500 miles of gasoline tank. There are many more entertaining features in the cabin that offer prime luxury to the passenger including a Uconnect infotainment system featuring a 5 inch touch screen media center. The infotainment system offers Bluetooth, USB, SD, and auxiliary connectivity. There are many more standard features like electric power steering, plus cruise control, electronic stability control, Hill-start assist, traction control, electric parking break, air conditioning with rear outlets, and keyless entry. 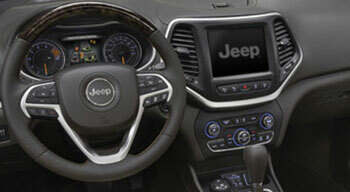 There are optional features that can be added to your Jeep Cherokee including CommandView, active drive lock, a 9 speaker Alpine audio system, dual pane panoramic sunroof, keyless entry, heated and ventilated power seats, heated steering wheel, and 18 inch aluminum wheels. The 2017 Jeep Cherokee is a complete crossover SUV that is both Sporty and practical. If you want an offroader than can perform and offer supreme comfort, this is the one you should get. So, what are you waiting for? 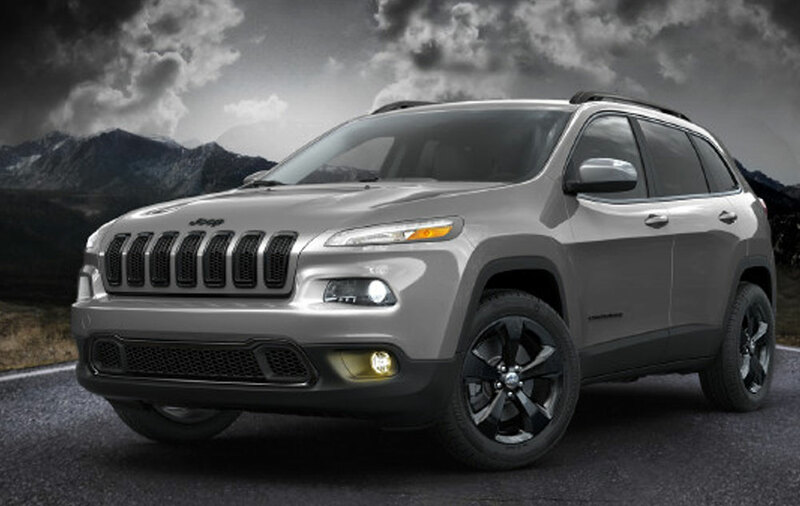 At, Derrick Dodge, we are offering free test drive for the 2017 Jeep Cherokee! Test the 2017 Jeep Cherokee at Derrick Dodge! Whether you’re ready to make a purchase or just curious if this might be the right model for you, take the drive from St. Albert or Sherwood park to get behind the wheel of the 2017 Jeep Cherokee at Derrick Dodge Chrysler Jeep RAM. Our doors are open to serve you seven days a week, and you can always contact us for more information.